Toyota's top brass offered embattled Environmental Protection Agency Administrator Scott Pruitt a private test drive in one of Lexus’ latest models late last year, and although it's not clear if there was ever a test drive, it's a potentially problematic pitch to the head of a regulatory body from a company subject to its regulation. Emails exchanged last fall between one of Pruitt's former top aides, Millan Hupp, and a representative for Toyota –- the parent company of Lexus -– indicate Pruitt's apparent interest in taking the Lexus LC500 for a test drive after visiting Toyota headquarters in Plano, Texas. The company sent several emails following up to see if Pruitt was still interested in taking a ride and offered to also show him the company's hydrogen fuel-cell vehicle, the "Mirai." "Just today, we took delivery of a brand new Lexus LC500 (the same car we showed him in the parking garage)," Tom Stricker, a vice president in Toyota's product regulatory affairs division, wrote on Aug. 31, 2017. "Is there a good day in the next week or so for the Administrator to go for a lunchtime drive?" "He saw one in Texas and seemed excited to take it for a spin," Stricker added. The emails, obtained by the Sierra Club through a public records request and subsequent lawsuit, indicate that staffers confirmed a time and place, and Toyota identified two vehicles, a Lexus LC500 and a Toyota Mirai, for the excursion. However, due to a last-minute scheduling issue, the "ride-and-drive" fell through. "Something has just come up that needs the Administrator’s immediate attention. Unfortunately, he doesn’t feel that he can leave the office right now. I sincerely apologize for the short notice, but can we postpone to a later date?" the aide said. "You have been so gracious and we hope to do this very soon." Toyota confirms to ABC that Pruitt never drove the vehicles. But critics have questioned whether the correspondence was appropriate. "Scott Pruitt is apparently incapable of saying no to corporate lobbyists in any context, whether it is on policies that sell out our health and our future, or on personal perks and experiences he simply must indulge," John Coequyt, senior director of federal policy for the Sierra Club, told ABC News in a statement. "Pruitt has become both a caricature and the example par excellence of incompetence, corruption, and petty grifting, and it's past time for him to resign," Coequyt said. In December, Pruitt said the EPA was "partnering" with Toyota to reform management at the agency, but in January, under pressure from environmental advocacy groups, the company pulled out of those discussions. 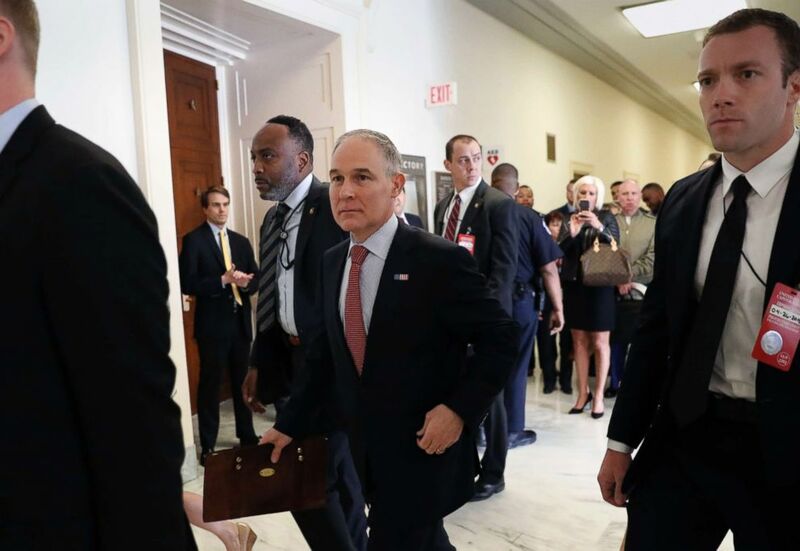 A spokesman for CREW, Citizens for Responsibility and Ethics in Washington, told ABC NEWS in a statement that Pruitt should have "Immediately declined" the the private test drive. "If Pruitt had taken the private test drive, he could have violated ethics rules on accepting gifts from a prohibited source," the statement says. "But it looks like ethics concerns were not what stopped this from happening--he should have immediately declined. Since he didn't, it raises questions about his impartiality in dealing with any matters that were pending that would have affected Toyota. "It also raises further questions whether he was inappropriately using a government staffer and government resources to arrange something for his personal life." This latest story caps a week of revelations about Pruitt's rocky stint at the agency. Earlier this week, ABC News reported that Pruitt's aides helped him look for an apartment, set up meetings about financial opportunities for his wife with Chick-fil-a, and even shopped for a mattress, raising questions about whether Pruitt violated federal rules by asking his employees to do personal favors for him on the government's time. On Wednesday, ABC News reported that two of Pruitt's top lieutenants at the agency were resigning, including Hupp, who communicated with the Toyota representative about the test drive. A second aide, Sarah Greenwalt, also announced her resignation this week. Editor's note: This story has been updated to include additional emails that have come to light since it was first published – and a response from Toyota that the test drives did not take place and calling the offer "routine business practice."